This website introduces a new, unique guide for members of the public who have a personal injury claim. 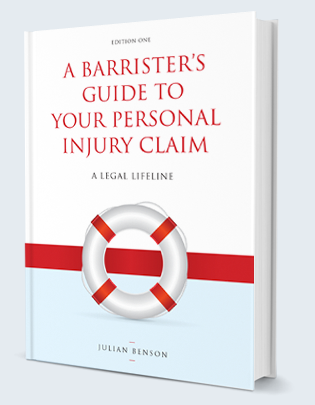 Written by Julian Benson, a highly regarded specialist barrister with 20 years experience, the guide contains authoritative, impartial advice about making a personal injury claim. The guide will enable individuals to understand and participate in their claim with confidence, as well as ensuring that they receive a professional service from their legal representatives. This will reduce the stress of the process and promote fairer, quicker and more cost-effective settlements. The Guide can be purchased from Amazon but is also free for individuals to download. In addition, Julian has recently co-written five articles with three distinguished clinicians, designed to explain litigation relating to chronic (or long term) pain. This guide is aimed at people who have suffered a more than short-lived injury. Read more . . .
Julian is a highly experienced personal injury barrister. Read more . . . Recommended by clients, solicitors and independent legal directories. Read more . . .
We really appreciate your guidance, support and professional judgment. It was a pleasure to meet someone who is so academic but also so down to earth. I have no reservations about recommending Julian to anybody looking to get a top quality legal consultation and service provided by pleasant professional legal personnel. It is so good to get all that stress out of my life and know that my family can have the sort of life that they had before my accident without worrying where the next penny is coming from. Thank you so much from my family and I. You saved my case when it was crumbling …so thank you. I was so glad to have you on my team. I appreciate all that you have done for me over the last few years. It’s nice to put this all behind me and move on with my life. You helped our family to cope with a serious injury, move forward, and work towards a really good settlement in only a few months. Thank you. A most fantastic result. I still don’t think it’s sunk in yet. I found Julian’s insight and advice extremely helpful. He was able to weigh the pros and cons of my situation and enabled me to make a well informed decision as to the final outcome. Thank you for all of your hard work and for getting such an amazing result. My wife now has the chance to move on with her life in a positive way ad for that we will always be grateful to you. Julian’s calm, effective approach made me feel completely reassured throughout what was to become a very long drawn out and at times stressful experience. I have received and appreciated the good advices of Julian Benson at a time when I needed reassurance, kindness, and hope. Julian Benson bought about an unprotracted and very favourable climax to what had been a life changing experience not only for myself but for members of my family. Julian’s professionalism and attention to detail were second to none. Julian was consistently professional and provided clear yet detailed advice and guidance. He was meticulous in his approach; always providing straightforward, jargon-free explanations to detailed, complex and often unfamiliar processes and situations. A personal injury claim is not the most pleasurable process to go through however, Julian’s calm and confident approach provided constant reassurance and enabled me to make well informed decisions that resulted in a positive outcome. With the ability to offer sage advice in an extremely professional yet personable manner, I would not hesitate to recommend Julian. The minute you became my barrister I felt you were approachable and I was fully supported, listened to and advised. Every time an issue arose you immediately found a way to address it, this impressed me greatly and, for me, showed your professionalism and your ability to do your job to the highest standard. I would have no qualms recommending you in fact I would go as far as to say that whoever instructed you would be using one of the best.